11 September 1914-16 November 1914: Transferred to Mobile Jäger Battalion 2. March 1915-8 October 1916: In the field with Jäger Battalion 2. 19 April 1915-21 June 1915: Detached to the Training Course for Officer Aspirants in Döberitz. 8 October 1916-26 January 1917: Deputy Company Leader in Jäger Battalion 2. 26 January 1917-22 May 1918: Transferred to the 1st Machine Gun Company of Jäger Battalion 2. 22 May 1918-22 May 1918: Repeatedly served as a Deputy Company Leader in Jäger Battalion 2. 22 May 1918-2 July 1918: Company Leader in Jäger Battalion 2. 2 July 1918-16 October 1918: Wounded/in hospital. 16 October 1918-24 February 1919: Company Leader in Jäger Battalion 2. 24 February 1919-1 April 1919: Detached with Jäger Battalion 2 to Border Protection Lyck. 1 July 1919-31 May 1920: Transferred to Infantry Regiment 39. 31 May 1920: Separated from the Army. 1 July 1920-1 October 1922: Accepted into the Schutzpolizei [Protection Police] in Lyck, Platoon Leader and Deputy Emergency Unit Leader. 1 October 1922-15 July 1927: Emergency Unit Leader with the Police Administration Berlin. 15 July 1927-3 January 1929: With the Police Administration Görlitz. 3 January 1929-1 April 1930: Detached to Berlin as Training Director. 1 April 1930-10 April 1934: With the Police Administration Hannover. 10 April 1934-15 October 1935: Instructor at the Higher Police School in Eiche. 15 October 1935-1 May 1937: Reactivated in the Army as a Company Chief in Infantry Regiment 55. 20 September 1935-31 December 1935: At the same time, detached to the Air War School Courses in Eiche. 21 January 1941-15 February 1941: Commander of Infantry Regiment 260 of the 113th Infantry Division. 15 February 1941-15 March 1941: Commander of Infantry Ersatz-Regiment 46 of the 193rd Division. 15 March 1941-15 October 1942: Commander of Infantry (later Grenadier) Regiment 430 of the 129th Infantry Division. [The division was engaged in the invasion of the Soviet Union from 22 June 1941]. 15 October 1942-2 February 1943: Commander of the Army Training School of the 9th Army on the Eastern Front. 2 February 1943-12 February 1943: Führer Reserve. 3 November 1943-1 February 1944: Führer Reserve in the Army High Command. 16 November 1943-14 December 1943: At the same time, detached to the 8th Division Leadership Course. 1 February 1944-16 April 1945: Commander of the 334th Infantry Division in Italy; renamed the 334th Volksgrenadier-Division on 30 April 1945. 16 April 1945-26 April 1945: Führer Reserve. 26 April 1945-1947: Prisoner of War. 19th June 1947 transferred from Rimini to Island Farm Special Camp 11. 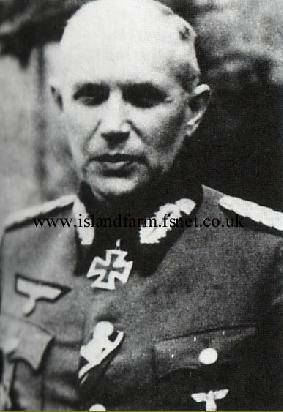 Knight’s Cross of the Iron Cross: 24 September 1942, Oberst, Commander of Infantry Regiment 430. Oakleaves (No. 716): 25 January 1945, Generalleutnant, Commander of the 334th Infantry Division. German Cross in Gold: 27 October 1941, Oberst, Commander of Infantry Regiment 430. Prussian Iron Cross, 1st Class (1914): 20 July 1916. Prussian Iron Cross, 2nd Class (1914): 12 October 1915. 1939 Bar to the Prussian Iron Cross, 1st Class: 9 November 1939. 1939 Bar to the Prussian Iron Cross, 2nd Class: 19 September 1939. Medal for the Winter Campaign in Russia 1941/1942 (“East Medal”): 28 July 1942. Cross of Honor for Combatants 1914-1918: 10 December 1934. Armed Forces Long Service Award, 2nd Class (18-year Service Cross): 2 October 1936. Armed Forces Long Service Award, 4th Class (4-year Service Medal): 2 October 1936. Mentioned in the Wehrmachtbericht [Armed Forces Communiqué]: 29 June1944; 24 September 1944.